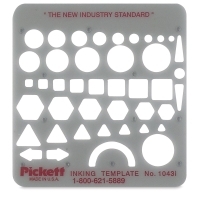 Suitable for a variety of general drafting needs, versatile Chartpak Pickett Arrow and Shape Templates are 0.13" thick and made with partially recycled plastic materials. 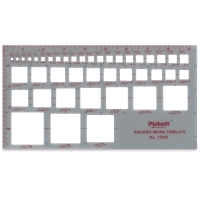 The durable, translucent smoke-gray templates are made in the USA. Built-in risers and smooth apertures reduce smudged lines. 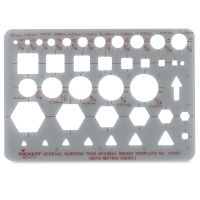 General Purpose Junior, 1043i — The 3" × 3" template includes circles, squares, hexagons, and triangles in various sizes. The circles range from 3/32" to 9/16" in diameter. 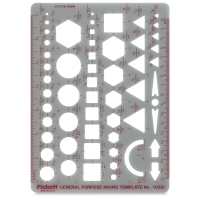 General Purpose Pocket, 1085i — The 5" × 3-1/2" template contains circles, squares, hexagons, and triangles. 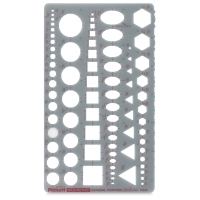 The circles range from 1/16" to 11/16" in diameter. Squares, 1205i — The 5" × 9-1/2" template features squares ranging in size from 1/16" to 1-1/2". General Purpose Metric, 1303i — The 6" × 10" template is scaled for metric measurements and features circles, squares, triangles, hexagons, and isometric ellipses in various sizes. The circles range from 2 mm to 30 mm in diameter. General Purpose Small, 1053i — The 4-3/4" × 6" template features various sizes of circles, squares, hexagons, arrows, and triangles. The circles range in size from 1/16" to 1" in diameter. General Purpose, 1033i — The 6" × 8" template features various sizes of circles, squares, hexagons, arrows, and triangles. 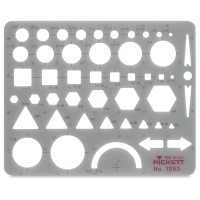 The circle cutouts range in size from 1/16" to 1" in diameter.